Saturated fat is traditionally known for being an unhealthy food source . . . but is it really? There is no way that this devilish food could ever be a staple, or even an afterthought, in any healthy diet, right? I mean the government-created myplate even states “a healthy diet is one that is low in saturated fats.” It seams that “healthy” food is synonymous with “low-saturated fat food.” But why? Where did this hatred towards saturated fat start? And when? Well, as it turns out, fairly recently. In 1977, the U.S. government created the “U.S. Senate Select Committee on Nutrition and Human Needs.” We will call them SCNHN for short. SCNHN created what is used as the basis of the average American’s “healthy diet,” and entitled it “The McGovern Report.” The committee then collaborated with the USDA to create “Nutrition and Your Health: Dietary Guidelines for Americans.” Yes, the original MyPlate. This list of guidelines specified that in order to maintain a healthy diet, one must “increase consumption of complex carbohydrates and ‘naturally occurring sugars;’ and reduce consumption of refined and processed sugars, total fat, saturated fat, cholesterol, and sodium.” These findings were conducted by senators and governors with “no background in science,” according the movie Fathead. The film has a nice overview of the McGovern report, which can be found here. In the 1940’s, before SCNHN, theories formed by scientist Ancel Keys linked saturated fat and cholesterol to heart disease. Ancel Keys was a scientist who studied the effects of nutrition on human health. He conducted a very large study called the “Seven Countries Study,” which examined 22 countries (Japan, Italy, England and Wales, Australia, Canada, USA, Ceylon, Chile, Mexico, France, Israel, Austria, Switzerland, Germany, Netherlands, Norway, Finland, Ireland, Lithuania, Check Republic). However Keys decided to only look at the results of 7 specific countries (Japan, Italy, England, Wales, Australia, Canada, and USA), selected because their data confirmed Keys’ hypothesis (that high saturated fat and cholesterol diets were causing heart disease). Lo and behold, after hand-selecting the data he wanted to use for his published study, Keys found a direct correlation between fat intake and heart disease, as shown by the graph on the left. Keys was not phased by the contradictory findings. 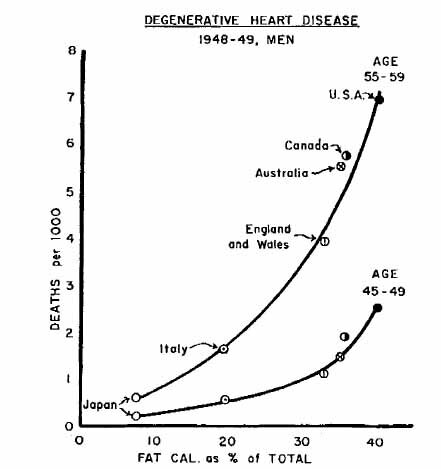 In 1980, Keys published “Seven Countries: A Multivariate Analysis of Death and Coronary Heart Disease” through the well-renowned and well-trusted Harvard University Press. His findings were quoted in Times Magazine (one of the largest, most influential, and most trusted magazines in American History) multiple times. Down went Americans’ saturated fat intake, up went Americans’ obesity epidemic, as shown by this video. Our epidemic started in 1985, just 5 years after Keys published his study, just 8 years after SCNHN published the first set of nutritional guidelines for the United States, and less than one year after Times magazine put out the article “Hold the Eggs and Butter” based off of Keys’ findings. Why, then, do the U.S. government, nutritionists, “fad diets”, or non-fad “fad diets” (Weight Watchers, Mediterranean, South Beach, etc.) all recommend low-saturated fat, low cholesterol diets? It has to do with money. Simply put, it’s cheaper to grow corn, soy, and wheat now-a-days than it is to grow just about anything else. Why? Because it’s government subsidized. Why is it subsidized? Richard Nixon. Why did Nixon subsidize corn? The Vietnam War. Why should you care? It’s killing you! Saturated fat benefits our bodies by giving it essential fat-soluble nutrients such as: vitamins K2 (essential in bone metabolism and can only truly be digested from sat fats), A (keeps you from going color blind), D (essential for bone health, among other things). Saturated fat makes up around half of our cell membranes. Lastly, saturated fat is also a great source for energy. When it comes down to it, saturated fat is not the “artery-clogging, heart-disease-inducing” phenomena that Americans see it advertised as. It turns out studies done on saturated fat and its relationship with heart disease are skewed, fraudulent, and an outright lie. In spite of all of the warnings against the consumption of saturated fats, America’s obesity rate has shot up to around 30 percent. Whatever you do in terms of eating in college, and for the rest of your life, you should know that the notion that saturated fat is “bad” for you, is indeed, false. Disagree? Have a saturated fat related question? Confused? Do you know something I don’t? Have something to share? Want to tell us something? Want a Caveman College t-shirt? Leave a comment. Max – Isn’t it crazy how wrong the medical community is? I really hope you’re going to be a scientist because we need more people who are into real science and not just fads or towing the party line for the medical community. It is quite the scandal. If only we put subsidize on organic fruit and vegetable farmers, free-range, grass-fed, organic beef, free-roaming chickens, etc. We really need to put a real emphasis on this. It’s either scientist, or political activist, or both! Love the post, and the website! Keep up the great work! Are you paleo/primal? I am Paleo and a CrossFit trainer. I got interested about 3 years ago, trying to lose weight, and studies medical literature and scientific research until I figured out what is really going on in my body. Then implemented it and the weight just melted off. I have since found out that Paleo and CrossFit are the things I researched my way to! Sounds like an awesome story Graham! Where’s the crossfit box at?